By Peter Anderson 7 Comments - The content of this website often contains affiliate links and I may be compensated if you buy through those links (at no cost to you!). Learn more about how we make money. Last edited November 1, 2011 . 1. Getting into debt. This has become more difficult for college students to do since the 2009 Credit Card Act made it mandatory for minors under 21 to have a co-signer or sufficient income in order to obtain a credit card. However, many students will still find ways to live it up beyond what they can afford, either by spending every cent as soon as it comes in, hitting up the Bank of Mom and Dad, or misusing student loans. What to do—Make a budget and stick with it. If you know how much you can spend on necessities and fun, it’s more difficult to get yourself in trouble. Also, making a budget will help you realize if you’re setting yourself up for failure. You will certainly spend more than you make if your monthly bills eat too large a chunk of your income. If you can use credit without getting over your head in debt, make sure you research which card will be right for you. The best credit cards for college students offer rewards like cash back and often are set up to help new borrowers learn how to use credit responsibly. 2. Not paying your bills. Even without credit cards, you can do serious damage to your credit score in college. Making late payments or skipping payments entirely can negatively affect your credit score for up to seven years. While it can be tough to stay on top of bill-paying when you’re entrenched in college life, work and everything else, it’s vitally important to start your good relationship with your money now. What to do—Be a responsible bill payer. If you’re not the type of person who can plan and remember to sit down once a month with your bills, then automate everything. Just make sure that you do have a monthly (or weekly) appointment with your online bank accounts to ensure that everything is running smoothly and you still have enough money for rent when everything is said and done. 3. Spending student loan money on pizza. Even if you’ve calculated precisely how much money you will need from your student loan, often you may find yourself at the end of the semester with “extra” student loan money. It’s very easy to regard that as “found” cash and spend it on whatever you wouldn’t otherwise be able to afford. But the bill will come due later, which means you’ll be on the hook for that amount plus the interest. What to do—Send that money right back to your lender. Technically, you’ll be making a payment, but it’ll be the best way to spend that money. 4. Skipping classes. The alarm rings at an unreasonably early hour and it can seem really tempting to simply turn off the alarm and sleep in. After all, it’s a lecture class, and it’s not like anyone will notice that you’re missing. However, you’ve spent money for the privilege of attending that class and learning. You can sleep on your own time—it’s a lot cheaper. Skipping classes cheats you of the education you are paying so much for. What to do—Show up for class! While it is that simple, you may find that your schedule of work, class, study time, sleep and fun might need to be tweaked to make sure that you have given yourself enough time for each one. Be cognizant of what you need when you make your class schedule. Don’t assume that coffee will get you through it all. 5. Making the wrong friends. Just as your parents warned you about hanging out with the wrong crowd in high school, the wrong friend in college can seriously hurt your finances. Watch out for the perpetually broke friends who just need to borrow “a little something” from you. (And then you find they used your money to buy concert tickets.) On the other side of the coin are the friends who either have more money or less understanding of credit than you do, and who always encourage you to keep up with their level of spending. What to do—Just say no. Keep your money to yourself and live in a way that will make your future bright. Because these “friends” won’t help you to achieve it. Being financially savvy in college may make you stand out from the crowd, but it’s important to remember just how good a distinction that is. Last Edited: 1st November 2011 The content of biblemoneymatters.com is for general information purposes only and does not constitute professional advice. Visitors to biblemoneymatters.com should not act upon the content or information without first seeking appropriate professional advice. In accordance with the latest FTC guidelines, we declare that we have a financial relationship with every company mentioned on this site. I def was quilts of number 3… Maybe more on clothes than pizza, but I used the “leftover” money from my loan for stuff instead of turning it around and saving it for paying back my student loan. I was terrible with money in college. My mother gave me 1k in spending money when I left, and it was gone in a couple months, even though all my necessities (Food and shelter) were already paid for. Luckily I wised up once I started working and have no debt other than my mortgage, and I skip the usual materialistic needs such as a new car. 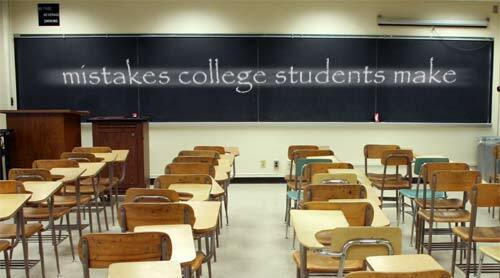 I believe for college students, they get into trouble because they believe a lifeline (parents) will bail them out if they get in over their head. I wish I had calculated out how much I could spend per week and make it last a whole semester. That’s what I do now on vacations with my planned spending money. Glad I eventually grew up! Not working in college. Part-time, internship, etc?